Eppendorf BioBLU® Single-Use Vessels combine the advantages of single-use technology with the trusted performance of stirred-tank design. Our convenient adaptor kits allow you to benefit from single-use technology with minimal invest. They are easy to install and compatible with Eppendorf DASGIP® and New Brunswick™ systems as well as common Applikon® and Sartorius® controllers. The kits include all parts necessary for running BioBLU Single-Use Vessels with the respective system, such as motor adaptor, exhaust treatment, and more. BioBLU Single-Use Vessels are available as BioBLU†c version for cell culture and BioBLU†f for microbial applications. 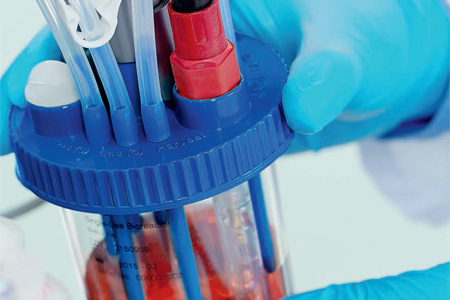 The packed-bed vessels BioBLU†p are designed for adherent cell culture and perfusion.